Littlehampton Book Services Ltd, 1976-03-01. Hardcover. Good. 1976-03-01. Good. Ships with Tracking Number! INTERNATIONAL WORLDWIDE Shipping available. May not contain Access Codes or Supplements. May be ex-library. Shipping & Handling by region. Buy with confidence, excellent customer service! London England: Cassell, 1976. Hardback. First Edition. Along the Cotswold Ways. Slight foxing to end inside covers and edge. Contents: Towards the Beginning. The Makers of the Ways. The Ways of the North Cotswolds. Ryknild Street and Buggildway. The Ways to Winchcombe. From Prehistoric Barrow to Nineteenth-Century Town. The Ways of Salt and Sheep. Iron-Agers Way. The White Way. The Welsh Way and the Ermin Way. The Ways to the Golden Valley.The Ways to Nan Tow's Tump and Hetty Pegler's. Towards Another Beginning. For Further Reading. Index. Illustrated. 207 pp. (We carry a wide selection of titles in The Arts, Theology, History, Politics, Social and Physical Sciences. academic and scholarly books and Modern First Editions, Reference books ,and all types of Academic Literature.). First Edition. Cloth. Very Good/Very Good. 8vo - over 7¾" - 9¾" Tall Octavo. Hardback. London England: Cassell, 1977. Hardback. Along the Cotsworld Ways. Foxing to top edge. Very slight shelf wear to top edge of D/J. Contents: Towards the Beginning. The Makers of the Ways. The Ways of the North Cotswolds. Ryknild Street and Buggildway. The Ways to Winchombe. From Prehistoric Barrow to Nineteenth Century Town. The Ways of Salt and Sheep. Iron-Agers' Way. The White Way. The Welsh Way and the Ermin Way. The Ways to the Golden Valley. The Ways to Nan Tow's Tump and Hetty Pegler's. Towards Another Beginning. For Further Reading. Index. Illustrated. 207 pp. (We carry a wide selection of titles in The Arts, Theology, History, Politics, Social and Physical Sciences. academic and scholarly books and Modern First Editions, Reference books ,and all types of Academic Literature.). 2nd Impression. Cloth. Very Good/Good. 8vo - over 7¾" - 9¾" Tall Octavo. Hardback. 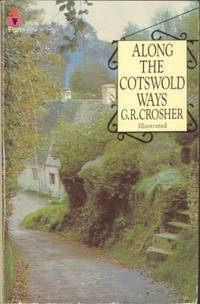 London: Cassell, 1976 price clipped DW otherwise both VG+, 207pp + plates, various road ways and track ways in the Cotswolds, from prehistoric routes to modern ones, routes described with historical information on the places etc. First Edition. Hard Cover. Very Good/Very Good. 8vo - over 7? - 9? tall. Cassell, 1977. 2nd impression. Hardback. cloth, dj, F/F, xii+207pp, 16pp b/w plates, b/w map, index, a nice fine copy. A history and travel guide to the ancient Medieval trackways and trade routes that cross the Cotswold uplands. Published by Cassell, London, 1976, 1st edition. Blue cloth boards, silver lettering to spine under illustrated dustwrapper. 8.75ins x 5.5ins, xiii, (i), 207pp plus 16pp illustrations. VG / VG. Littlehampton Book Services Ltd. Very Good in Very Good dust jacket. 1977. Hardcover. 0304294624 . viii + 207pp, illustrated, map, bound in blue clovers with VG dustwrapper ; 8.60 X 5.20 X 0.50 inches; 207 pages . London: Book Club Associates, 1977. Reprint, 8vo, 207pp, photo illustrations; VG Copy in VG DJ. Reprint. Hard Cover. Very Good/Very Good. 8vo - over 7¾" - 9¾" tall. London, Pan Books, 1977. Paperback . 224pp. Illustrated. Roads used by those from Roman and Saxon to Welsh drovers and salt carriers. VG..
London: Pan Books, 1977. Soft cover. Near Very Good/No Jacket. Larger format paperback 224 pp, illustrated. Near Very Good condition. No dust jacket.